Already our monthly pay & allowances are being deposited in PO SB A/cs where CSI rolled out in SOs/HOs. In some divisions, CSI is yet to be rolled out and the GDS are paid allowances through manual procedure. 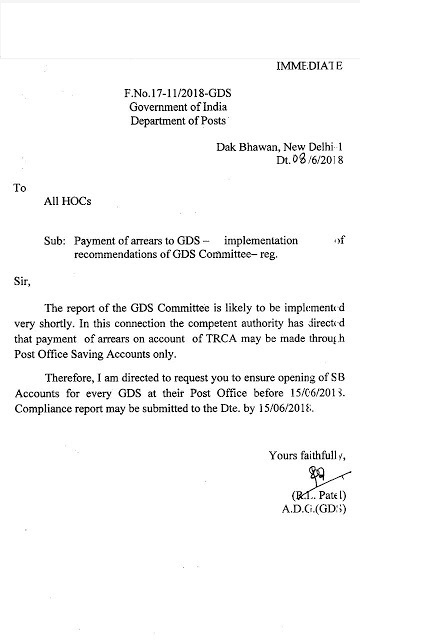 For the purpose of future drawals the respective GDSs are requested to open PO SB A/cs at their post offices before 15-06-2018 and report to the concerned well in time. The Branch / Divisional Secretaries, active comrades to request our SPMs to take all measures to open POSB a/cs for GDSs under their jurisdiction and the action ensured well in time.